January 14th, departed San Francisco in driving rainstorm. January 15th, arrived Buenos Aires in driving rainstorm. January is the middle of the Argentine summer but it had rained 11 of the prior 14 days so all of my memories of BA are wet. Let me start by saying that my trip was arranged by Rachel Andras of Flywater Travel for the fishing and Alicia Holdy of Holdy Tours for everything else and it was flawless. I told Rachel that I would like to have at least 2 guides (first for more variety of instruction and style and second, if I didn't like one, the time would be limited), did not want to spend time in lodges with a lot of other people and would like a variety of water. 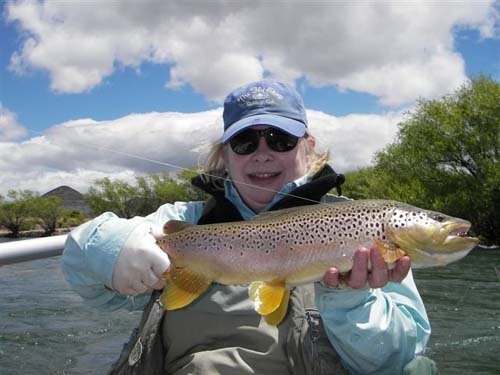 Rachel set me up with two great guides, small fishing lodges and estancias, and fishing on small rivers, drifting on rivers, spring creeks, small lakes and large glacier fed lakes. Every day was a new adventure. Rachel recommended Alicia who specializes in trips to Argentina. I could have arranged my flight from San Francisco to BA but Alicia was able to also book my interior flights with local agents and saved me a big chunk of money. Alicia also arranged all of my ground transfers and, again, it was flawless and I was very well taken care of. I can't recommend both Rachel and Alicia highly enough. I do not speak Spanish but had been told by numerous people that everyone in Argentina who comes in contact with tourists speaks English. Not true. I was picked up at the BA International Airport by the driver arranged by Alicia who promptly told me - "no English". He was right there when I got out of customs, grabbed my suitcases and took me to the Damas (ladies room) and then to his car. We did manage to communicate because in the 30 minutes it took to drive into downtown BA and my hotel, we established what I was doing in Argentina (fly fishing for trout which I would release), where I would be fishing (San Martin de los Andes and Cholila), commentary on "The Movie" (trucha in agua, mosca in agua), and answered his questions on the difference between Washington D.C. and Washington State which previously had him very confused. I am sure that I would have enjoyed my trip much more if I spoke Spanish, but as one of the guides told me, "You people from the United States don't speak Spanish, you all speak Mexican." Right here I should point out that the Argentines are known throughout Central and South America as being a little full of themselves. A woman from Puerto Rico was part of this discussion and she told me that the purist form of Spanish in South America was spoken in Columbia because they had the least immigration. She said the people in Argentina think they speak Spanish but they really speak Spanitalian (I made that up, she just said a lot of Italian). During the mid 1800s the saying was that for every two boats that came to the US, one went to BA. Both the US and Argentina had large amounts of land that they needed settled. Argentina has a very European population with lots of Italians, Germans, English, Welsh as well as Spanish. Suggestions from Rachel: don't exchange money. US Dollars are welcome everywhere but your change will be in pesos so take lots of $1, $5 and $10s. Don't count on ATMs. For the most part, you won't be anywhere near them. Take the cash and pay your bigger bills with your Visa card. Take all of the equipment you think you will need. What is available is not consistent. They carry mostly US brands, but then shipping and 50% luxury tax is added on so prices are a little higher than here. They use all of the flies that we use on our rivers so you don't need to buy flies. I used flies from every box I took, and I took 14 boxes. I arrived in BA in the early afternoon and was met at the hotel by Alicia's people, checked in and given a 24 hour cell phone number for any emergencies while I was in Argentina. I had a couple of hours before my city tour so decided to go across the street from my hotel for lunch. I had been told that I would have lots of beef in Argentina so I selected a langoustine and rice entree since BA was a seaport. I found out later that the water around BA is so polluted that all of the seafood is imported. Beef is considered so common, that I was rarely served beef and had to arrange my last lunch in Argentina so I could have a really great steak lunch. That afternoon, I had an informative and wet tour of BA that included the major areas of the city and all of the sites. Normally, January is when everyone is outdoors, there are antique fairs, street fairs, and tango festivals. We had so much rain, thunder and lightening, that everything was closed down and the streets were deserted. 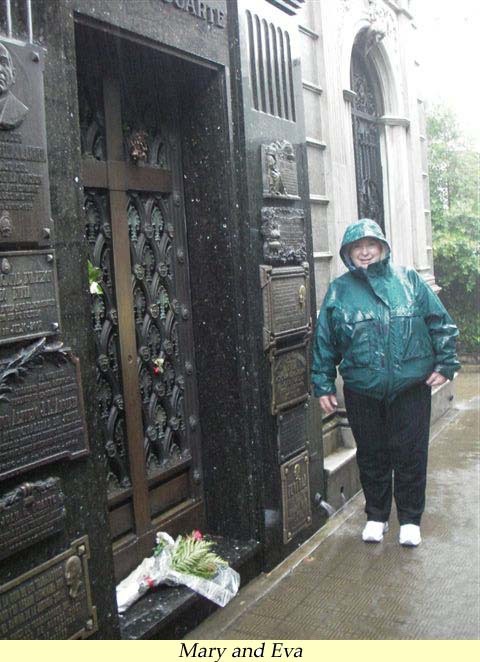 The good news is that all of the sights were empty and I got to walk right up to Eva Peron's plaque at the cemetery. The next day I was picked up and driven to the domestic airport which is at least another hour outside of BA and in the opposite direction from the international airport. There is supposed to be a good reason why the two airports are so far apart. For domestic flights, if you have luggage plus fishing gear, you will be paying excess baggage but it wasn't too expensive. Again, Alicia's people took care of me and I flew across Argentina to the base of the Andes and the town of San Martin de Los Andes. They were happy to see me as I brought the sun. San Martin is a ski town in the winter and a small resort town on a beautiful little lake in the summer. Think Incline Village and North Lake Tahoe. I got all of my shopping done on my free day as the rest of the trip would be spent at estancias (ranches) or fishing lodges. Ramon Aranguren and his wife, Christina, took me to a wonderful dinner at the Pub & Fondue. Dinner was perfecto. We started with small rolls and venison pate, then spring rolls with a wine vinegar reduction, then venison with a sauce to die for, then exquisite chocolate dessert. All accompanied by Malbec, the Argentine equivalent of Cabernet without the sulfites and tannin. The owners of this restaurant are all from BA with varied prior occupations ranging from landscape architect, attorney, marine biologist and all have made a major life change, moved to San Martin and run this perfect restaurant and grow most of the food. 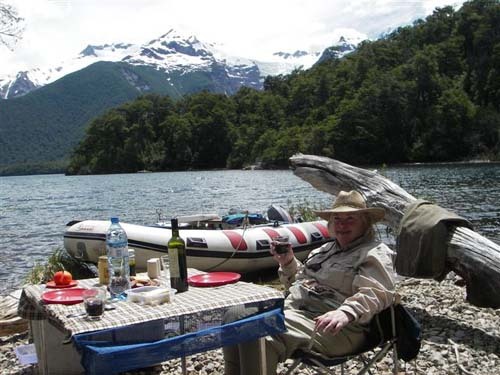 Next morning, my guide, Javier Gonzalez Pannuti, took me to the Estancia Mamuil Malal where I would stay for two nights and we would fish the Malleo (say Mah zhay ho). The Estancia Mamuil Malal is the oldest in the area, established in 1892. Bertil Grahn and his wife, Delores Peters, are charming and excellent hosts. The Estancia raises and trains polo ponies, cattle and large tracts of pine trees. On arrival, Bertil met us in full gaucho regalia including the gun in the holster and the knife tucked into his belt in back. He was so elegant and I was so in awe that I never got his picture and I am still upset about it. But I have a great picture of Javier (guide) and Delores in the estancia dining room by the boar that Delores shot last summer. This is their summer estancia and the large building was built in 1965 and Delores has decorated it with a combination of shabby chic (that is a popular style, guys) and hunting lodge. They just opened their section of the Malleo two years ago for fishing. Because of the late rains, the water was high and fast and it was great having a guide who wasn't that much taller than I was. We did some deep wading and found some beautiful fish, both browns and rainbows. Second day on the Malleo, winds kicked up and fishing was tougher. The Malleo is a beautiful small river which you walk and wade with herds of horses and cattle in the distance. This is one of my favorite rivers both for the river and for the estancia and I look forward to going back. he had thought this would be an easy fishing day with lots of fish. He admitted that is what he had been thinking. I told him to immediately start thinking no fish and tiny fish or we were in danger of being skunked. Once we got our thoughts focused on a hard fishing day with no fish, the fish started really hitting. They weren't as big, but I was catching multiple fish on each cast through the pools. Javier was having me shake them off if they weren't big enough to save time. A typical day fishing in Argentina starts at 7am. You get up and get your gear ready and eat breakfast at 8. Breakfast is cereal, yogurt, milk, oj, toast, eggs, bacon or ham, cheese, and sweet breads. Yes, all of them. You set out at 8:30 and drive anywhere from 1/2 to 1 1/2 hours to your fishing area for the day. Fish until 2pm. Lunch is carried along in huge white coolers that are packed with water, soft drinks, Malbec, appetizers, salad, main course, and dessert. This is a two hour lunch and the Malbec flows. Then back to fishing until 9pm. Drive home, clean up, dinner from 10:30 - midnight. Sleep and start over. Javier is one of the best guides I have ever been out with. Gracious, totally there for me and protective of both my safety and comfort. Wry sense of humor. Figured out very quickly all he had to say was "brown trout" and I would wade anywhere and do anything to get where I needed to be. Perfect guide especially over 4 long days of fishing, travel and meals. He found lots of trout in all kinds of water. Downside, he's in his 30s and I kept up with him for 4 long days. Because we were in cattle country, we had to navigate through several locked gates. The guides didn't want me doing anything, but I insisted on helping with the gates. I managed the first two just fine, but they are heavy and you need to fasten them tight because the cattle lean on them. The third gate, I was really focused on getting the chain locked up as tight as I could and Javier started honking the horn on the truck. I wondered who he was honking at since we were in a pasture, but I was focused on that lock. He got out of the truck and come up to the gate and politely told me that I had to be on the other side of the gate. And I had insisted on doing this small job. I was very careful the next couple of gates but sure enough, I started that focus thing again. This time, when Javier honked, I immediately knew what to do and was very proud of myself when I got back into the truck. Told him what a quick learner I was. He said that I had still been on the wrong side of the gate but I told him that this time, he didn't have to get out of the truck to tell me that. January 21st non-fishing day. I was driven to Bariloche where I was picked up by Nico Martin, my guide for the next week. Rachel had warned me to bring fast sinking line, but mine wasn't fast enough. In Bariloche, they were out of the Teeny lines so I purchased a 200wt Scientific Angler sink tip line that is a dream to cast. We had set out from Collon Cura Lodge at 9:30am and arrived in Cholila at 8:30pm. This included a stop in Bariloche for lunch and quick trip for supplies to the fly shop, then a stop for ice cream in El Bolson and a visit to the local crafts fair. Nico is from Bariloche but guided for two years in Jackson Hole and is a great guide. Rachel told him that I knew a few jokes so we had a great time as he was able to contribute his share although they were mostly agricultural in content. Cholila is a small town in a very pretty valley. They are developing the area and in a couple of years, it will be an established resort community. 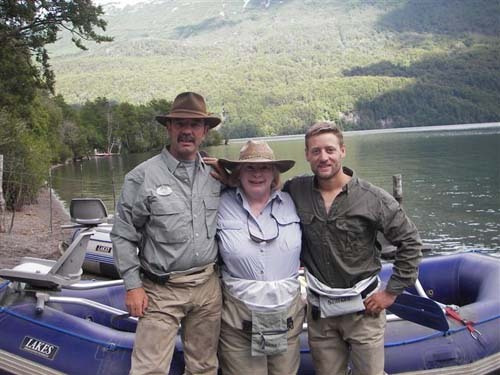 I stayed at El Trebol Lodge and met 3 guys who had been fishing buddies for some years. In fact two of them had fished together since they were kids. El Trebol is run by Marcos and Yiya Jaeger. Again, I was very well taken care of and really enjoyed my stay. Next morning we drove from Cholila to Lago Rividavia and Rio Rividavia. Beautiful. Rio Rividavia is my favorite river in Argentina. While we were still on the Lago, a game warden came out in his boat to check our licenses. He was very stern and very macho about it. I asked Nico to ask the warden if it would be ok if I took his picture. The warden looked at me and, very sternly, said "$10". I looked at him and asked, "Brad Pitt?" and got the picture of him laughing. You don't need that much Spanish. Rio Rividavia has lots of fish - lots and lots, nice size and very strong. Nico and I were fishing on our own, but Marco and Jorge had the three guys that were also staying at the Lodge. There is a myth that men don't communicate. Give them a walkie-talkie and try and get them to shut up. The next day we put in at Lago Verde (the exit from Rio Rividavia) for our trip to Lago Menendez. You take boat across Lago Verde and a Range Rover backs a big cart into lake and you power up and onto the cart staying in the boat. Ferries, holding up to 100 people, also dock here and the people disembark to walk the 1mile through jungle to Lago Menendez to be picked up by ferries on the other side. I got driven through the crowd and jungle a little like a float in the Rose Parade and then we got launched at Lago Menendez. 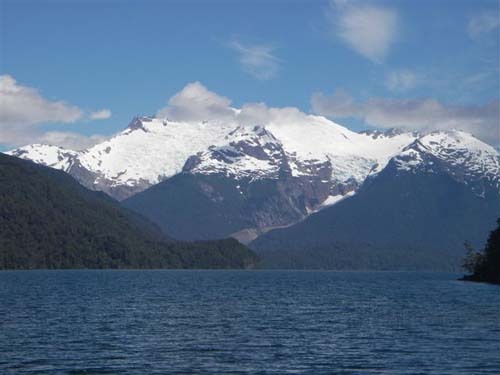 Lago Menendez is a large lake partially fed by two glaciers. This is one of most beautiful lakes that I have seen. Big rainbows, browns and brook trout. I hooked and didn't land two browns that were so big, they broke my heart when I didn't land them. We were the only people fishing. Except for the few ferries that went by in the distance, we had this enormous lake to ourselves. The next day we fished Lago Verde in the morning. The fish would only take damsel flies in the air or the bug-ugly, green nymph. In British Columbia, the fish will aggressively attack a damsel fly that is sitting on the water. On Lago Verde, you had to figure a way to keep the fly in the air or the fish just weren't interested. After our normal, huge lunch Nico rowed us down Rio Arraynes which is supposed to be the most beautiful river in Argentina. It isn't fished too often as it is only 3 miles long and known to be difficult. But, everyplace there should have been a fish, there was one, and they were big. 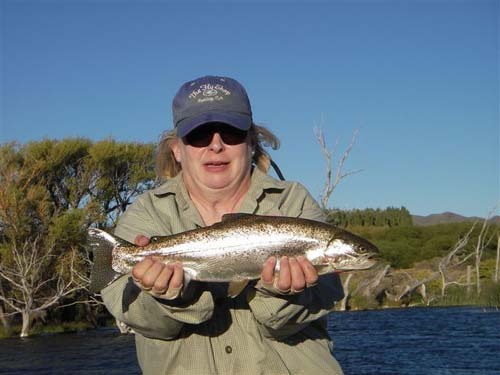 Very few Argentines fish. The story that I got was that in the 50's, Mel Krieger was looking around for a fly fishing destination and decided on Argentina. He worked with the Argentine government and convinced them that if they wanted a sustainable, world class, trout fishery, it had to be catch and release. You are allowed to keep one fish smaller than 13" a day from a lake but nothing on the rivers. Since 90% of the people who catch and release started out catching and keeping, if you never are going to catch and keep, you just never get started and don't spend the money or take up the sport. 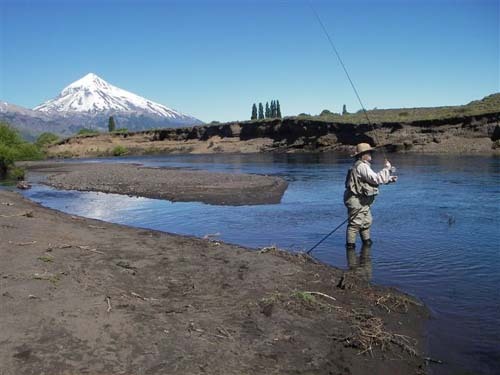 January 25th moved to Estancia La Elvira and fished the Rio Gualjaina. This is a beautiful creek, half spring fed and half snow melt with 27 miles running through the Estancia. I landed at least 60 fish all on Turck Tarantulas. We never fished anything else and had fish bumping into each other to get to the fly. 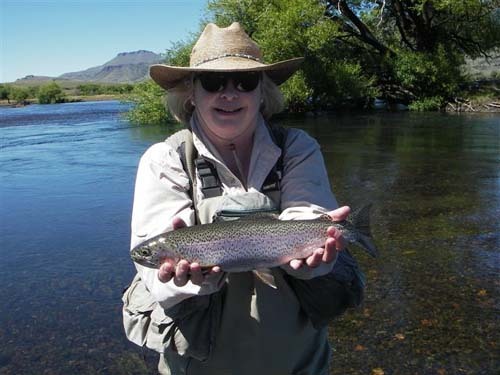 Jan 26th - Arroyo Pescado, spring creek and the most difficult fishing of the trip. This was either a good thing as I had many great days of fishing behind me and, theoretically had gotten a little better. Or, it was going to be a dismal way to end my trip. The rules are that you walk only on one side of creek and no wading. At the top of the creek there are some hogs, but they won't budge. I told Nico that, whatever size, I was taking a picture of my first fish because that might be the only one of the day. But I caught lots of little fish and a few medium sized using dries and nymphs. I caught a lot of small fish on a mouse pattern which was fun as I hadn't fished that before. After lunch, all I caught were small fish and then nothing. We went back to top where the big guys were hanging out and cast and cast and cast streamers. Nico switched me over to a Turck Tarantula and I wasn't enthusiastic as we had only seen one rise. Again, many casts with the wind blowing the fly all over the creek. Finally, at 8:30pm, I asked him - "Last cast?" and he said, "Si, senora". I put it out, the wind caught it, and it didn't end up where I wanted it. I reeled in my excess line and started reeling in the line on the water and stopped. This was the last cast of my trip and I wanted to respect it. I started stripping and on the third strip, one of the big guys came up and took it. I did a fair amount of swearing and told Nico that if I didn't land this one, I would cry all the way home. I fought him (the fish) through the weeds and pulled him out from under the cutbank and finally, landed him and got the pictures. Perfecto. What a way to end the trip. Trip home: January 27th, drove 4.5 hours from Estancia to Bariloche, 2.0 hours in Bariloche (fantastic steak lunch), 2.5 hours flight to BA. I was picked up by Alicia's people and driven across BA to the international airport. Then another 2.0 hours in BA airport, 7.5 hours to Miami, 2.5 hours in Miami and customs, 5.5 hours to SFO. Long trip home, 28.5 hours. I called Rachel and told her to forget New Zealand and Russia for 2007. I am going back to Argentina.